Aeryn's Creative Explosion: Card: Happy Australia Day! There's a little challenge in the Make it Crafty group to create *anything* for Australia Day so I figured I'd try it out. Yes, Aussie Day was Saturday, but the challenge goes until the 31st... something I didn't know when I was colouring this. I got it done in about an hour, 6pm Aussie time, so I thought I just made it in under the wire. That's why this looks so slapdash. It's 5"x3.75" and I'm not used to working this small either. I wanted to colour it bright because it's Spring in Australia right now and it'd be bright and sunny... I'm assuming. 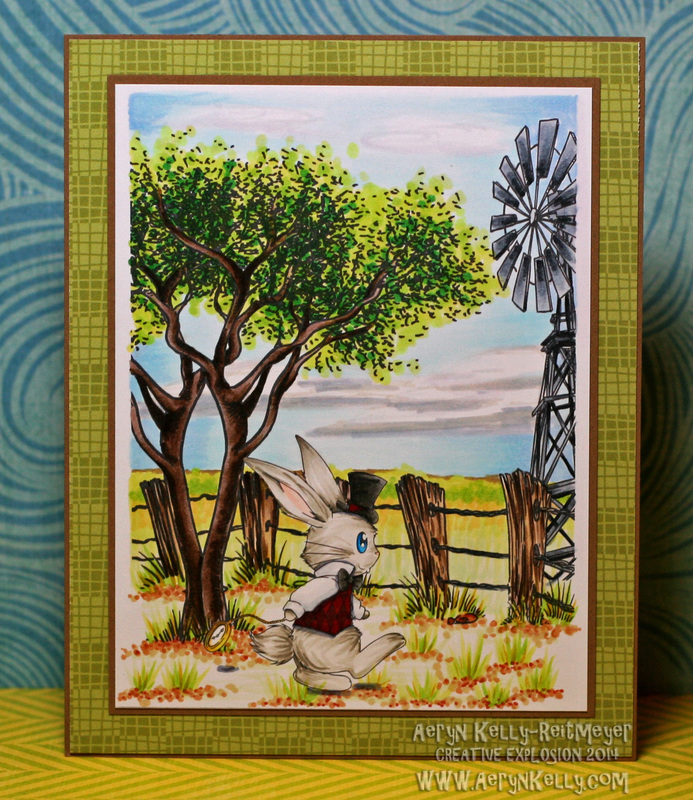 I did a good bit of manipulating on the fence and windmill to get the scene just right. The scene is completely constructed by me. It's not terrible, I might go so far as to say it was "good", so here you go. Aussie readers, I hope you had a great day! I too absolutely loved your scene and and thought not only was the colouring fantabulous but I loved the scene using the famous 'rabbit proof fence' in outback Australia." Awesome Aussie day card Aeryn. Zoe is gonna love it.